Philipp Winterberg (EN): New Arrivals: Dual Language Editions of "St. James Way in a Tuxedo"
New Arrivals: Dual Language Editions of "St. James Way in a Tuxedo"
New arrivals: "St. James Way in a Tuxedo" is now available in 12 bilingual editions: English-French, English-German, English-Spanish etc. St. James' Way in a Tuxedo? Really? Really. A Danish pilgrim has arrived wearing his finest get-up because he thinks that Spanish restaurants won't let him in otherwise. For more than a thousand years, pilgrims have followed St. James' Way – you would expect that by now, word about a good packing list would have spread already. On the contrary: many pilgrims arrive with enormous backpacks, weighing 20-30 kilograms, and damage their feet, knees and shoulders before spending lots of money on sending huge packages back home. 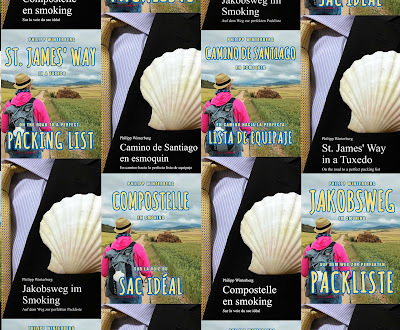 In short episodes, the author describes the confusion of getting equipment, eventually making his pilgrimage to Santiago de Compostela carrying only 3 kilograms in his backpack. This equipment guide is a must-have for every pilgrim!